Time and time again... I get so happy whenever someone uses me as a Vocal Coach. Here's the WhatsApp Group Chat I had with my friends. [12:27, 28/06/2014] fONS: I didn't think u'd (have) any problems coz u always sound natural. I'm guessing... Harsh probably coz too much Chest Tone.... and Airy... prob too much Head Tone. Work on the right balance. 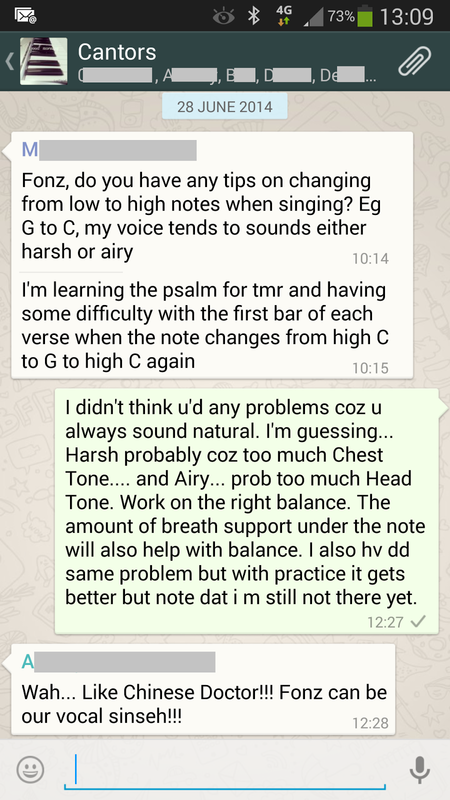 The amount of breath support under the note will also help with balance. I also hv dd same problem but with practice it gets better but note dat i m still not there yet. [12:28, 28/06/2014] AT: Wah... Like Chinese Doctor!!! Fonz can be our vocal sinseh!!! 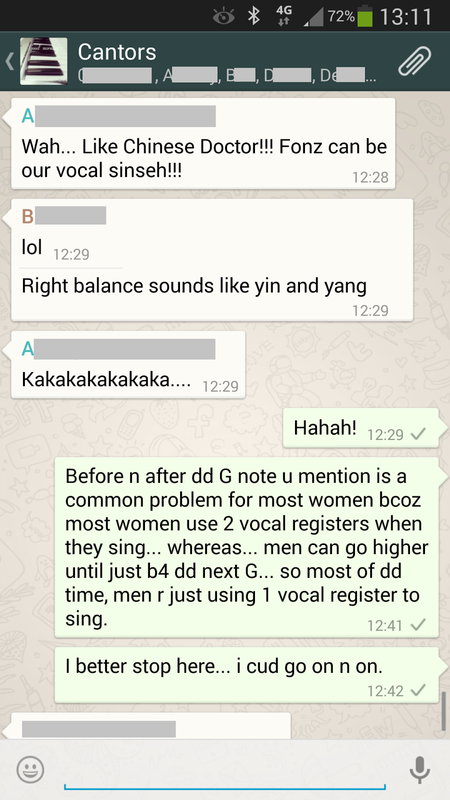 [12:41, 28/06/2014] fONS: Before n after dd G note u mention is a common problem for most women bcoz most women use 2 vocal registers when they sing... whereas... men can go higher until just b4 dd next G... so most of dd time, men r just using 1 vocal register to sing. [12:42, 28/06/2014] fONS: I better stop here... i cud go on n on.